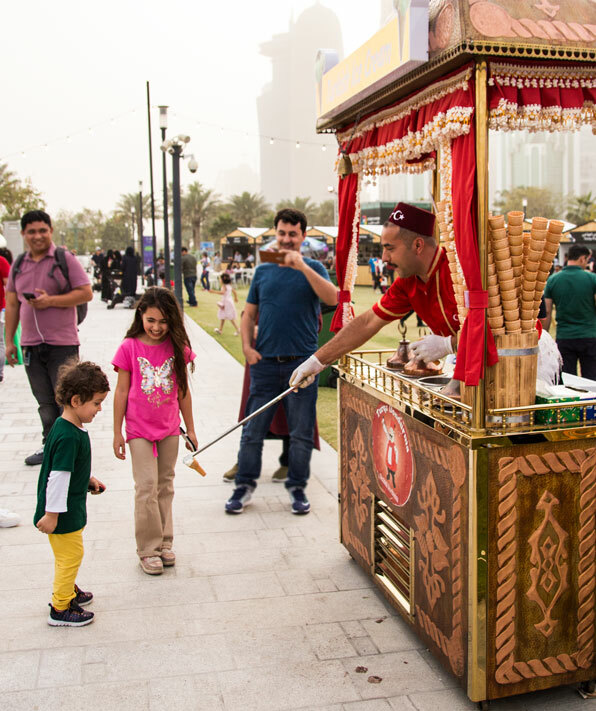 Qatar International Food Festival (QIFF) 2018 opened on 15 March and continues for 11 deliciously fun-filled days in the heart of Doha at Hotel Park. Even if you have attended this event before, there will still be much that’s new to see and do. The number of food stalls and attractions has grown by more than a third and includes 177 stalls, food trucks and trolleys, covering 80,000 square metres of the park. The Festival was opened in grand style in an area which became the Live Cooking Theatre. Austrian celebrity chef Wolfgang Puck help to launch the festivities, and there is a list of worthy chefs participating: Qatar’s Aisha Al Tamimi who co-hosted the opening, US MasterChef Christine Ha, Indian celebrity chef Ajay Chopra, and many more. For those who are more interested in sampling the food rather than watching it being prepared, there are all those aforementioned stalls, and they offer a taste of the entire world. This is a truly international food festival reflecting the cultural diversity of the population of Qatar. One can find dishes from the USA, South Africa, Vietnam, the Philippines, Turkey, Lebanon, Mexico, India and Ethiopia, and even a tea purveyor from Singapore. One can also try local dishes which will likely be new to tourists. The main festival stage will host a variety of spectacular shows from around the world. Kuwaiti singer Abdulaziz Louis and Lebanese band Wahdon will take to the QIFF entertainment stage for free live performances on the evenings of 23 and 24 March respectively. Throughout the festival, there will be live performances by Doha-based hip-hop dance troupe Beats and Bytes, as well as Music Vending Machine, The Doha String Quartet & Friends, and Doha Jazz. But kids are not forgotten at QIFF 2018. This is a family-oriented festival and designed with every age in mind. 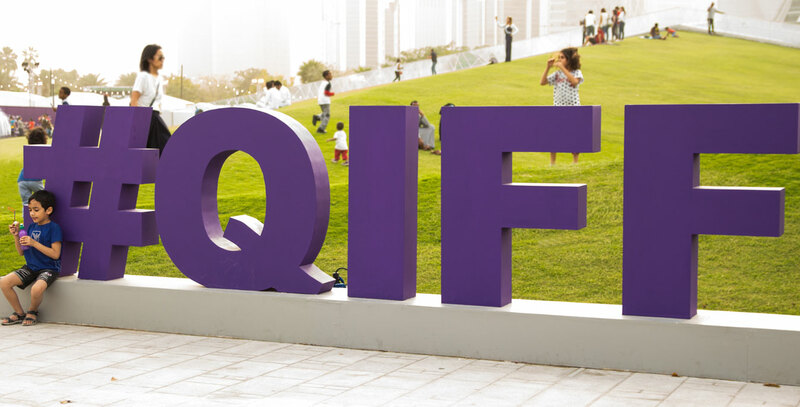 This year, QIFF has expanded the children’s area to include a mini zoo and farmer’s market, sports, dancing, balloons and even Turkish ice cream stalls which provide both frozen treats and exercise trying to get hold of one – an activity which youngsters are sure to enjoy. 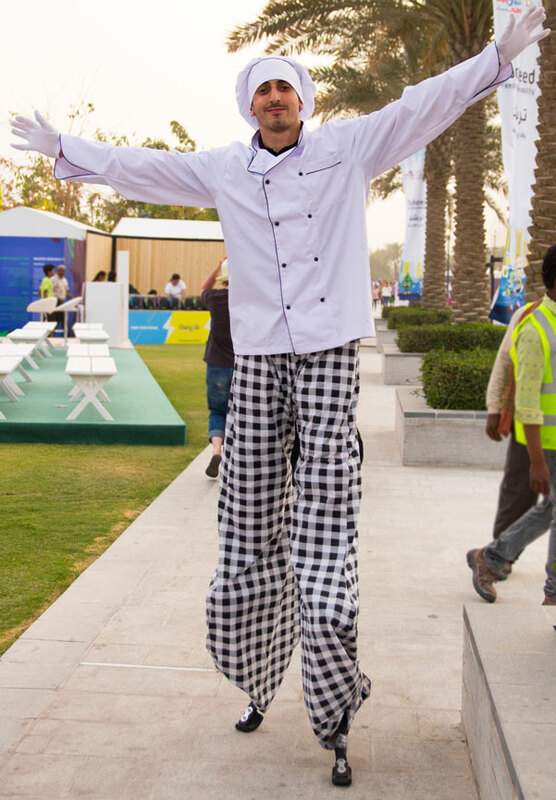 There are also several stilt-walking ‘chefs’! Every evening at 8pm a short fireworks display will illuminate the sky over Doha. The show will be followed by screenings of Winnie the Pooh and Finding Nemo. I wouldn’t mind staying for that myself; I am sure parents will be grateful! Anyone visiting Doha at this time should visit Qatar International Food Festival (QIFF) 2018. It’s vibrant with plenty for the whole family to do and see. Browse the stalls and select international and local dishes for a picnic on the hill. Enjoy the backdrop of the striking Doha skyline and make a promise to return again next year. This festival is growing in both size and reputation, so come early, stay late and be part of it. Kuoni (www.kuoni.co.uk) offers a three-night, half-board stay at Sharq Village & Spa in a Deluxe Resort Room including flights on Qatar Airways from London Heathrow and private transfers in resort. The price for selected dates in August and September 2018 based on two adults sharing is from £979 per person with a saving of up to £447 per couple. Sharq Village & Spa is a luxury waterfront Doha resort located 15 minutes from the Hamad International Airport, on 350m of private coastline. Featuring 174 luxury hotel accommodations, an award-winning spa, world-class dining and impeccable service, this distinctive five-star hotel in Doha is an idyllic coastal retreat.